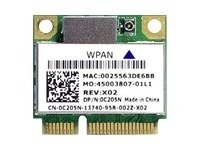 Dell Wireless 420 Ultra Wide Band (Wireless USB) Mini-Card, Access your email, download files, and browse the Internet when and where you need with Dell Wireless 420 Ultra Wide Band Mini-Card. Designed for laptops, its UWB (Ultra-Wide Band) technology allows devices to be connected to a laptop without cables. Moreover, it often used to connect wireless USB hubs and docks.